Resolute in its commitment to deliver the ultimate aftermarket experience to coach operators across the U.S. and Canada, Prevost offers the largest service network in the coach industry. Fifteen Prevost Service Centers strategically located throughout the U.S. and Canada, along with more than 175 certified service providers in the Volvo network, keep coaches on the road and businesses running smoothly. The newest Prevost Parts & Service Center opened near Orlando, FL, in August and is now fully operational with the recent opening of the Parts department. The 43,000 square-foot facility features nine service bays and a multi-million dollar parts inventory. A grand opening event is slated for November 7th. The event will feature tours of the facility, new and pre-owned coach test drives, and prize raffles, including the always anxiously-anticipated NASCAR Weekend raffle. The new location, located in Winter Garden, also includes a Pre-Owned Sales Center. Highlights of the expansive center are the availability of on-site sales, four bays dedicated to coach refurbishments, and space for up to 100 pre-owned coaches. Last year more than 650 technicians and mechanics successfully completed one or more of the numerous technical programs offered by Prevost. Enhancement and enrichment of an already robust training program has led to the creation of the Prevost Technical Institute™. The addition of proprietary preventive Prevost UPTIME® service agreements is also augmenting the breadth of Prevost aftermarket services. 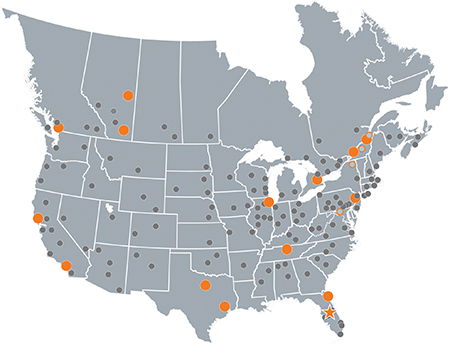 This map highlights Prevost’s service centers in the U.S. and Canada. The star represents the newest Prevost Parts & Service Center near Orlando, FL. The training available from Prevost is extensive. An expanded menu of special training events, classes and seminars, in addition to online webinars, is bringing highly specialized information and data on the Prevost H-Series and X-Series, as well as the Volvo 9700, to a greater number of customers in every area of North America. According to Robert Hitt, director of Aftermarket Training North America, last year more than 650 technicians and mechanics successfully completed one or more of the numerous programs offered by Prevost. Operators and technicians are invited to connect with the Prevost Technical Institute and stay tuned to the e-media page for the newest training opportunities as the company plans an ambitious schedule for 2019. 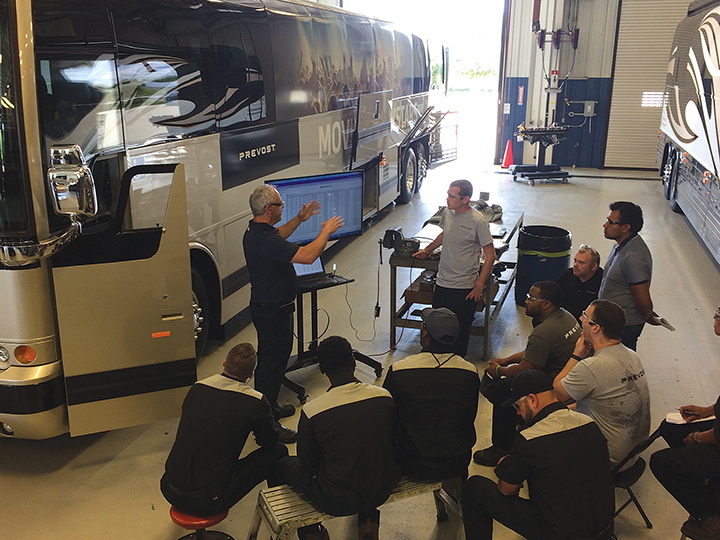 Prevost Commercial Customer Training, the company’s most ambitious training regimen after its Annual Factory Training conducted in Quebec City, Montreal, takes place at select Prevost Service Centers across the U.S. and Canada throughout the year. Prevost now offers the largest service network in the coach industry. In keeping with the company’s ongoing commitment to quality products and exceptional customer service, Prevost invites all Prevost and Volvo 9700 motorcoach technicians and mechanics to attend its tuition-free service seminars at their nearest Prevost Service Center in the U.S. or Canada. Seminars are conducted throughout the year at multiple locations. In addition, Prevost conducts and maintains an online library of more than 40 recorded technical webinars for viewing — no user ID or password required, so attendance couldn’t be easier. Respectful of customers’ budgeting and time constraints, the newly developed Prevost UPTIME® service agreement program covers expenses associated with OEM maintenance services, inspections and all necessary preventive maintenance required to keep coach fleets safe and compliant and reduce downtime. 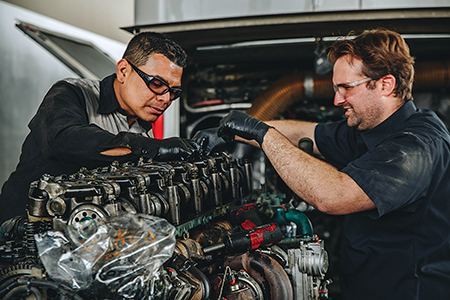 Costs stemming from a Prevost UPTIME® service agreement are spread evenly over the contract period, so operators know precisely their upfront the cost of preventive maintenance for the duration of the contract. Preventive maintenance service, available in varying tiers, consists of planned inspections within specified time periods to protect an operator’s license and seamlessly reduce the risk of the business coming to an unexpected standstill due to maintenance issues. Using its exclusive Prompt software, Prevost tailors UPTIME® contracts individually to match the specific operating conditions for each vehicle. Each service agreement covers the costs of genuine Prevost and Volvo parts and the standard routine consumables such as fluids, filters and belts. Help is now closer and faster for coach operators and drivers in need of assistance. According to Castillo, finding the nearest facility is an effortless process using the Prevost Service Locator mobile app. Additionally, customers always have access to Prevost Action Service System® (PASS). PASS is an operator’s indispensable resource for assistance and technical advice anytime, anywhere from qualified and trained Prevost representatives. In effect 24/7 all year long, help directly from Prevost for operators in any situation is closer and faster than ever before. The phone number for Prevost Action Service System is (800)-463-7738. 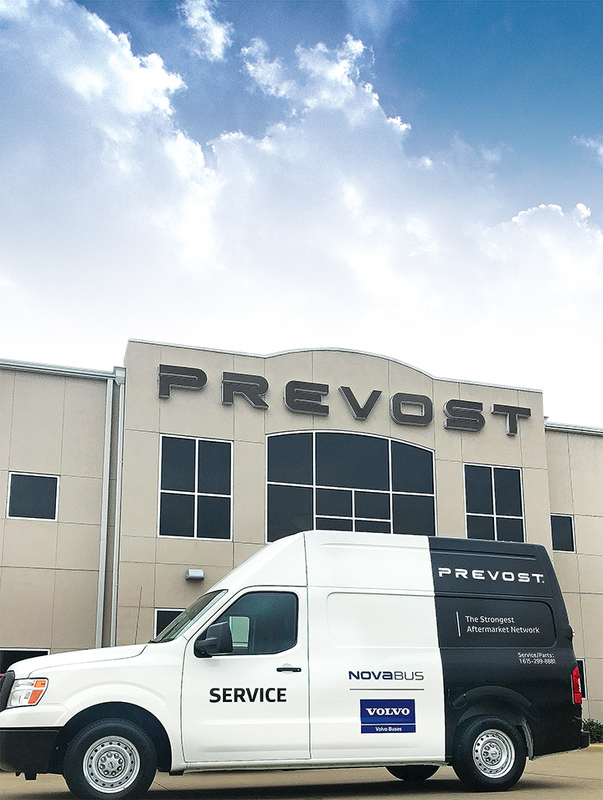 To better assist in emergency situations where a coach has become immobilized, Prevost has grown its emergency roadside service to include nearly 60 fully-equipped, fully-stocked mobile maintenance trucks. Prevost Mobile Service by factory-trained technicians is also available for scheduled maintenance and repairs at the customer’s place of business. These new and innovative maintenance programs from Prevost, combined with the company’s unyielding dedication to all matters of maintenance, safety and convenience, simply keeps the coaches out on the road where they should be.